﻿Les McCann had already been playing his way through the clubs and record studios on the US west coast for ten years when his appearance on 21 June 1969 at the relatively new and jazz-soaked festival in Montreux on Lake Geneva changed all that. There, he celebrated his greatest musical success, his number one hit. Half ironically, but proudly in later concerts, when the piano stool could hardly bear him due to his size and weight, he stressed that "Swiss Movement" had supported him, his wife, children and grandchildren. "Compared To What" is a catchy melody that is heard on the radio, again and again, all around the world, today, tomorrow and the day after … It is unmistakable, still groovy, full of soul, humorous, stirring. And "Cold Duck Time" is no way inferior: Eddie Harris blows for all he is worth. Everyone can hear that Benny Bailey was challenged by the unknown themes, but this maestro still managed to capture the audience’s ear and attention. 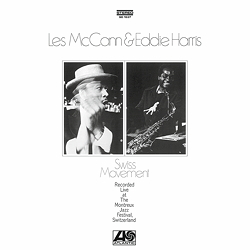 "Swiss Movement" is, and will remain forever, a highlight among all the jazz LPs that have been recorded live and it shouldn’t be missing from any collector’s shelf. Along with Benny Goodman’s Carnegie Hall Concert from 1938, Charlie Parker & Co.’s Massey Hall concert from 1953, and Ella Fitzgerald’s Berlin concert from 1960 – and very few others.